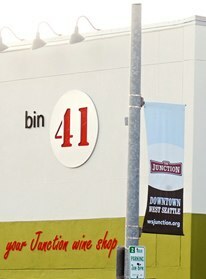 Welcome to the website for bin 41, your West Seattle Junction wine shop! annual inventory break. HAPPY NEW YEAR...SEE YOU IN 2019! We are a specialty retail wine shop with a ‘by the glass’ space located in the West Seattle Junction. We carry a diverse portfolio from around the world, with a strong emphasis on wines crafted within our Pacific Northwest. ‘Specialty’ doesn’t mean expensive...our focus is on offering small production, family operated selections at competitive, affordable pricing. We strive to give you access to value added selections as well as exposing you to new, undiscovered gems. You asked…thou shall receive!! For years our faithful customers have been asking if they could sit down and order a glass of wine. Now you can! Looking for some great wines for your next get together or to add to your cellar? Stop into the bin and check out our always expanding selections. We taste through and hand select almost every wine in the bin to ensure quality at every price point. Annual TINY BUBBLES tasting, 12/31 from 1-3 pm. Visit your West Seattle wine shop in the Junction...we have the perfect selection to meet all your special occasion and day to day wine needs! Now offering wines ‘by the glass’ in the front space! Glass pour is available at the bin in the front space. We have separated the shop into two areas ('By the Glass' -and- Retail) and have added a new entry door. The first door (original shop entry) closest to the sidewalk, is now the door for the 'By the Glass' space which is restricted to 21 years or older. For customers just stopping by to grab a wine to take home or if you are with minors, please use the new retail entry (2nd door to the left, slightly further down the hall). Glass pour service is available during regular business hours. See the top of this page for shop hours. There is no such thing as too many opportunities to discover good wine. Proprietors of bin 41 in West Seattle welcome you to come and explore the vast and exciting world of wines! Our West Seattle wine shop can be found at the intersection of Alaska and California streets, in the heart of the West Seattle Junction.